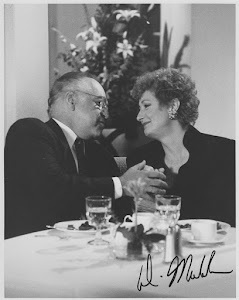 Richard Dysart and Diana Muldaur in L.A. Law. "What blew my mind was how good all the actors were and how good the writing was. I didn't kow that anything that good could make it on TV." About L.A. Law. "I must say, Rosalind is ethical. She has a code. She just has absolutely no tact. She never went to charm school." About her L.A. Law character. "I didn't really know Gene. I only got to know Gene through the Star Trek Christmas parties. I got to know him and Majel, a little bit, too." 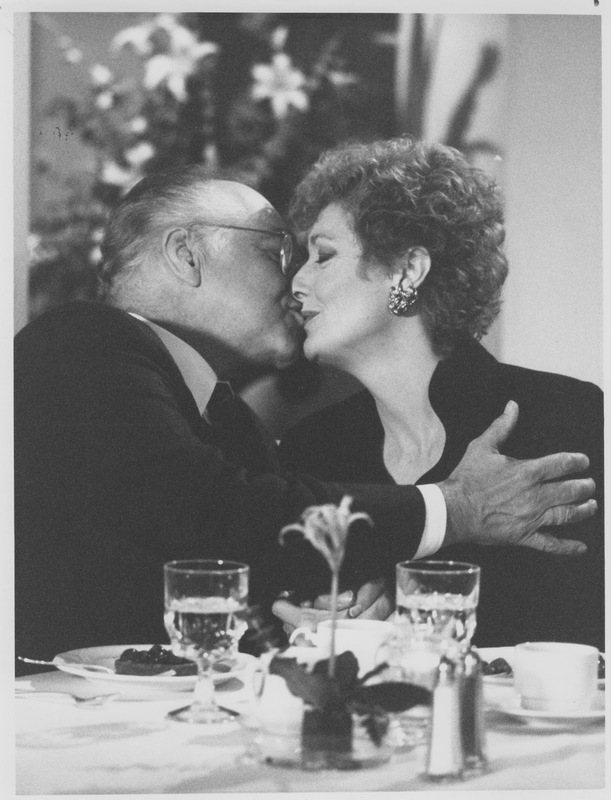 About the Roddenberry couple. "It was a very interesting role - she was quite mad, and that's always fascinating to play." About her role in The Other. "Oh, there was lots of talk about Lana Turner. She fretted about her hair, her clothes - running through designers faster than the studio could replace them. The fact was she needed all that for security. And she tended to be late. But let me tell you something. When she was there she was all there. It made quite an impression on me." About The Survivors. "Obviously, they wanted her to stir things up in the office. I don't think they quite understood how she was going to stir things up in America ... " About Rosalind Shays in L.A. Law. "Roz is very good at was she does. She's a brilliant lawyer and a brilliant businesswoman. If a man did what Roz does, he'd be accepted. A woman doing it seems to horrify people." About her L.A. Law character. "I think I trust animals more than people. They're more honest in their feelings. They haven't learned how to deceive. If they don't like you they let you know." "I never really planned to be there very long." About Star Trek: The Next Generation. "First of all, I didn’t like her name. So I said, 'I might do it if you can change her first name.' Gene stared at me very strangely and said, 'Let me think about it.' Then he said, 'OK, you pick your own first name.' I thought Kate would work just fine." About her Star Trek: TNG character. "When I did L.A. Law it was very interesting, because I instantly got offers for shows where someone gets to throw a tomato in my face. Lots of interesting reactions to that part because of her strength. A lot of take-offs on the Rosalind Shays role that had me being ridiculed. It was very interesting." "He and I just had a fabulous meeting. I thought it was very important that a new kind of executive woman be portrayed, and portrayed right. And that was his idea as well." About her first meeting with L.A. Law's head writer/executive producer David E. Kelley. "A lot of women don't know there's a women's movement." "It was very long days. We had a British crew and we were being worked straight trough, and finally they had to ask for a few days off. There were snakes and heat and illness. People would get violently ill. Falling down on the set. Exotic, yes, but a very, very tough shoot. The animals were heaven. I loved them." About Born Free. "Diana acted so well. She had the whole country talking." Richard Dysart (Leland McKenzie in L.A. Law). "We were amazed, because we all loved the dynamic that was going on between her and Dysart. We were all very sad to see her go." Jill Eikenberry (Ann Kelsey in L.A. Law). "We're two professional actors with complete trust in each other." Richard Dysart (Leland McKenzie in L.A. Law). "What a kick! I love her! We hit it off right away. 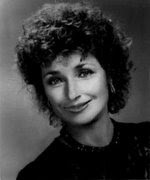 Diana Muldaur is so nice and so fun, a great sense of humor. It's great having her around." Michele Greene (Abby Perkins in L.A. Law). "Diana is a wonderful, wonderful person." 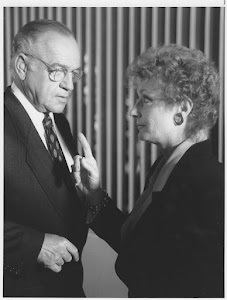 Richard Dysart (Leland McKenzie in L.A. Law).